Nike Zoom Fly Flyknit are neutral racing running shoes. The striking Nike Zoom Fly Flyknit hits the market after impressive marathon's World Record from Kipchoge in Berlin 2018 and at the same time than exclusive (because of both price and availability) Nike Zoom Vaporfly 4% Flyknit which features disruptive ZoomX instead of React foam in midsole. 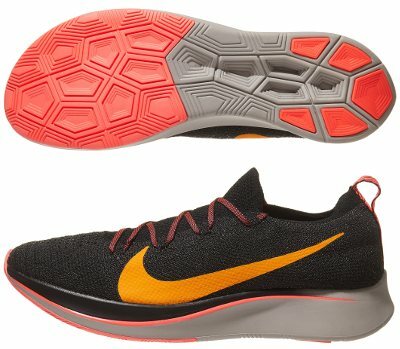 Some people can get confused because of brand naming so current Zoom Fly Flyknit is not a special edition of original Zoom Fly but actually a Zoom Fly 2 with completely revamped upper made of premium Flyknit, React foam instead of LunarLon in midsole that also includes carbon fiber plate replacing nylon one. As mentioned above, there are many changes compared with its predecessor Zoom Fly which did not perform as expected regarding sale figures, something typical among first editions. New upper features premium Flyknit mesh (used in other top running shoes like Epic React Flyknit) providing ultra-lightweight support that fits like a glove based on bootie construction. Oversized and reflective Nike logo (Swoosh) stands out from clean and modern design while forefoot includes several holes to improve breathability. The other major change takes place in midsole where not only well known LunarLon foam has been replaced by React one but also includes the same full-length carbon-fibre plate used in the Vaporfly 4% instead of carbon-infused nylon one. The only that remains in mdisole is the 10 mm drop. Perhaps Nike is waiting for unbiased feedback about performance of ZoomX and React blend featured in Zoom Pegasus Turbo. No changes in outsole plenty of pentagonal shapes in different sizes to optimize performance depending on the area and softer rubber in the forefoot offering great grip but raising big concerns about durability.